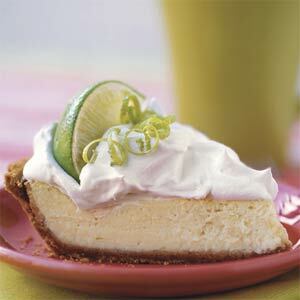 I admit without reservation that Key Lime pie is one of my most favorite desserts. On our way to New Orleans we stopped at a restaurant for a late lunch. Not one of our usual stops but we were hungry. They had Key Lime pie and I splurged after my meal and had half a piece. It was a not bad pie as “store-bought” pies go, had decent flavor, even if it left a bit of a chemical aftertaste. Here is my take on the tart and tangy southern pie. KLP shouldn’t be too sweet and it shouldn’t be pasty/chalky tasting, shouldn’t stick to your tongue. It also shouldn’t be colored lime green (as it used to be when I was younger). What it should have is a smooth, creamy texture, a bit of a bite to it and have a nice crumbly pie crust soaked in the juice of the filling. I can taste it even now sliding over my tongue, its tart tangy flavor countered just right with the sweet hardiness of the crust. I can’t wait to get to the city of good eats, New Orleans, and dive into someone’s famous Key Lime Pie. Yep, I’m lickin’ my lips in anticipation. Go on now, go find some and we’ll savor it together! Laissez les bons temps rouler et bon appétit! I'm a new follower via the A to Z Challenge.